Ebisubashi-suji Shopping District Promotion Association (established April 26, 1989) This shopping street started as the 1913 as the Ebisubashi-suji Coordination Association and then the Ebisubashi-suji Shopping Association before becoming the Shopping District Promotion Association (Incorporated). Since 1615 when Dotonbori River was complete and Ebisubashi bridge was built, the area has been prosperous as a route for those making pilgrimages to Ebisu shrine praying business prosperity during Toka-Ebisu festival as well as the entryway to theater town, Dotonbori, and it developed as a shopping street at the end of the Edo era. Entering the Meiji era it developed as the shopping street of the Namba terminal with the completion of the former Hankai Railway (currently Nankai Railway) (1885), the opening of the Namba branch of Takashimaya (1932), the opening of the Midosuji Line Namba Station (1935), and the post-war opening of the Kintetsu Namba Line (1970). Entering the Heisei era, urban renewal progressed including the opening of Namba Marui and the leading Cinema Complex in Kansai, Toho cinemas Namba(2006), the completion of the newly rebuilt Ebisubashi bridge (2007), the opening of the Hanshin Namba Line (2009), and the redevelopment of the Nankai Terminal Building and the expansion of the Takashimaya Osaka Branch (2010) with the outfitting of the Dotonbori River waterfront (from 2005), the rebuilding of the Toho Nangai Kaikan building. Casual fashion shops subsequently continued to gather from north to south from Ebisubashi-suji to Shinsaibashi-suji after the H&M Ebisu Branch's opening at Ebisu Kitazume(2010). From around this time foreign tourists started to increase, and the shopping street began measures to handle the inbound traffic. At the same time, development continued with the cooperation of the Minami area such as summer festivals and light display events to color Dotonbori River in the summer with lights as well as the 400th anniversary of the digging of Dotonbori River in 2015 to convey the charm of the charm. In the Ebisu Hyakufuku Tales, published in 2013, you can see a detailed history of the shopping street. This shopping street has been beloved by everyone in the Osaka area while also bringing more and more tourist visitors year after year who want to see "Dotonbori and Namba" to get a feel for the real Osaka. It has spread not only all over Japan but also around the world, especially throughout Asia. As one of the world's busiest shopping districts, Minami features various shops, unique areas such as Dotonbori and the Hozenji Yokocho Street, food culture and the arts, and the fun of strolling around. This shopping street situated as its main street plays a fundamental role as "safe, clean, and bustling passage through Minami". The Ebisubashi-suji Alliance was established in 1913, on the 100th anniversary of which an Ebisubashi-suji shopping street brand design was established and a variety of events were held in 2012. Environmentally, large-scale improvements to the arcade were completed in 2014. Rules were enacted and restrictions strengthened to prohibit solicitation of customers into brothels, bars, etc., with the cooperation of the government and citizens, as well as anti-crime inspections, fire-fighting drills, and store staff working together to clean the shopping street area three times a month, all of which are efforts to create an environment that visitors can feel safe coming to. 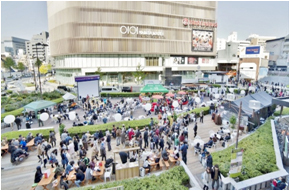 Efforts to reorganize the plaza in front of Nankai Namba Station and the surrounding road spaces to widen pedestrian space are underway with the cooperation of the people in the area and the government. their grandparents as well as good friends can casually go out to and interact with one another. We strive to be a town which reveres the origins of "Ebisu" which developed from Toka-Ebisu as a shrine road since the Edo period and brought us where we are today while also conveying the feeling of good fortune found by those who visit and work here. We want to be a place where people gather to walk and talk, shop, connect with other generations, and create memories. 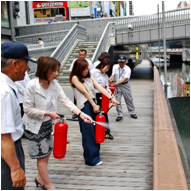 【2】 We want to be a shopping street at Namba Station that is clean, convenient, and safe for our visitors. What we want to focus on the most is using the convenience of being located near the 4 "Namba Stations" to develop a sense of cleanliness and comfort that will make people want to come back again to walk around and visit. Building on the trust built by our predecessors, we want to be a first-rate shopping street that is true to its name as the central shopping street of a world-class shopping district where people can shop with excitement and peace of mind. 【3】 We want to be a shopping street that is bustling with human warmth and has the feel of Osaka. 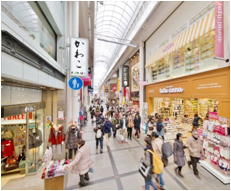 From old shops to chain stores and large outlets, we work hard to maintain a lively Osaka-esque variety of shops in harmony with one another. Rather than anything-goes, we conduct creative and original business with solid customer service in a humane way, not in a way following the manual. We provide kind hospitality for our customers visiting Osaka from Japan and abroad to make sure they feel a meaningful encounter with the people of Osaka. 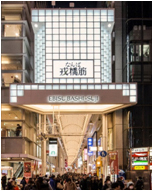 It represents the shopping streets in Namba, but its formal name is "Ebisubashi-suji shopping street". The green used in the "Ebisu" of the official logo represents bamboo grass which is attached to talismans for good luck. And the Symbol Character "Ebitan" is "Ebisu", the god of business prosperity, made into a character. It was designed by international illustrator Seitaro Kuroda (K2). we try to cooperate with society as much as we can in a variety of ways. Cooperating with the neighboring shopping streets and offices as well as the government, our union members conduct daily crime patrols, cleaning activities, etc. in the area. We conduct a bridge cleaning of the "Ebisu Bridge" twice a year. Participating in the Minami Vitalization Conference, the Minami Environmental Cleanup Promotion Conference, the Osaka City South Shops Association, the Minami Town Growth Network, and the Namba Safe and Secure Prosperity Town-Building Conference, we proactively promote and take part in town-building in Minami. We provide support with aid and personnel for events such as the Kabuki Boat Ride, Bunraku Puppet parading, Dotonbori River Buddhist Lantern Festival, Minami Jazz Walk, Dotonbori Bar Festival, and the Osaka Light Feast. We also support traditional events including the Hoekago Procession and Namba Yasaka Shrine Funatogyo ceremony. We provide a place for announcements and presentations by local high school students and an opportunity for learning through creating maps and providing guidance for foreign tourists in cooperation with vocational schools. To help the child-rearing generation spend time in Namba, we work in cooperation with an NPO group to provide a temporary nursery service, maps to help child-rearing families and seniors, and implement a shopping street experience program that parents and children can participate in together.